The age, spreading rate and asymmetry at each grid node is determined by linear interpolation between adjacent seafloor isochrons in the direction of spreading. Ages for ocean floor between the oldest identified magnetic anomalies and continental crust are interpolated by geological estimates of the ages of passive continental margin segments. 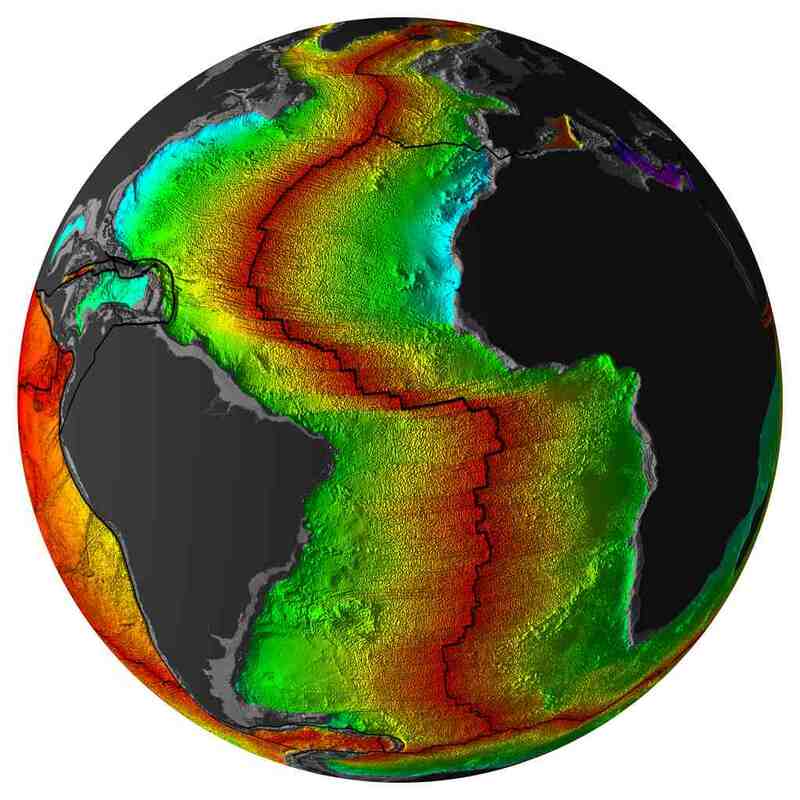 The age uncertainties for grid cells coinciding with marine magnetic anomaly identifications, observed or rotated to their conjugate ridge flanks, are based on the difference between gridded age and observed age. The uncertainties are also a function of the distance of a given grid cell to the nearest age observation, and the proximity to fracture zones or other age discontinuities. Asymmetries in crustal accretion appear to be frequently related to asthenospheric flow from mantle plumes to spreading ridges, resulting in ridge jumps towards hotspots. We also use the new age grid to compute global residual basement depth grids from the difference between observed oceanic basement depth and predicted depth using two alternative age-depth relationships. The new set of grids helps to investigate prominent negative depth anomalies, which may be alternatively related to subducted slab material descending in the mantle or to asthenospheric flow. A combination of our digital grids and the associated relative and absolute plate motion model with seismic tomography and mantle convection model outputs represent a valuable set of tools to investigate geodynamic problems.